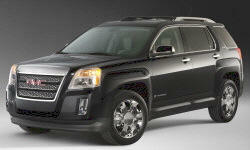 GMC Terrain Pros and Cons | Page 1 of 1 | Why Not This Car? What drives people to buy (or not buy) a certain car? TrueDelta's members share GMC Terrain pros and cons based on their real-world driving experiences. This car gave us nothing but trouble. Although it had some really good features, they were not enough to make us keep it. We bought it used with about 20k miles on it. If you want an SUV, that drives like a sedan, and has some serious high-end appointments, consider the GMC terrain. I don't reccommend this vehicle. Main reason for purchasing was we wanted a vehicle that was AWD, could tow small loads and would get reasonable fule mileage. I bought this vehicle primarily based on it's advertised highway fuel spec of 32 mpg. I'm pleased with the vehicle in most regards, good handling and ride but max highway mpg is only 26-27, not what I thought I was buying. Fuel economy was a big factor in purchase decision. Real world mileage not really close to 32 epa rating, but still pretty decent for a big, comfy station wagon-esque vehicle. I love how well the Terrain navigates curvy roads; it hugs the road and feels solid and controlled. I also am impressed how well Terrain handles bumpy road conditions. Brawny, unique, "love it or hate it" design. Carbon Black Metallic Paint is beautiful, day or night. Reasonable features for the price of the car.